Learn how to prepare for when the big day arrives. Remember when Black Friday was just for America? Videos would appear online of people in the U.S. fist-fighting over discounted designer goods at Bloomingdales and we'd laugh and say, “You wouldn't get that in the U.K." Well, this was before Black Friday arrived on our shores in 2013. The first year everyone was a little unsure about what to do. What is Black Friday? Why should I care? Will everyone be taking part? Consequently, 2013 was a little “lacklustre", but then in 2014 this happened. For me, this is when Black Friday really landed in the UK and it has shown no signs of dying down since. Year on year it continues to grow. You can see exactly how much interest has grown for Black Friday by comparing 2013 and 2016. Quite a significant jump! Increasingly it's no longer about Black Friday itself and is becoming more and more about the whole week running up to this major retail event. 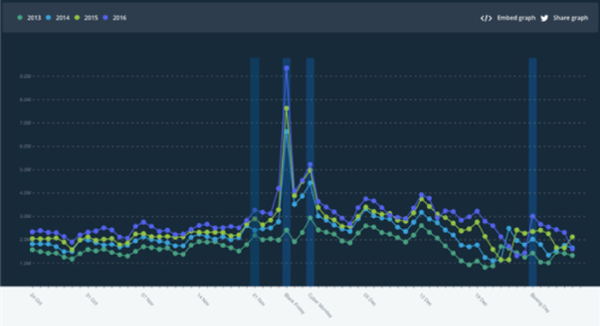 In the graph below you can see interest takes a significant leap from the start of the week, around 21st November, several days before Black Friday. You can also see just how important Black Friday now is. The huge peak in the centre of the graph shows the number of transactions on Black Friday 2016, which were up 318% compared to an average 2016 day. And it's no wonder really. Based on the video above, who wouldn't prefer to sit at home and shop online for bargains when the alternative is putting on some protective padded clothing and diving into a punch-up in Asda? 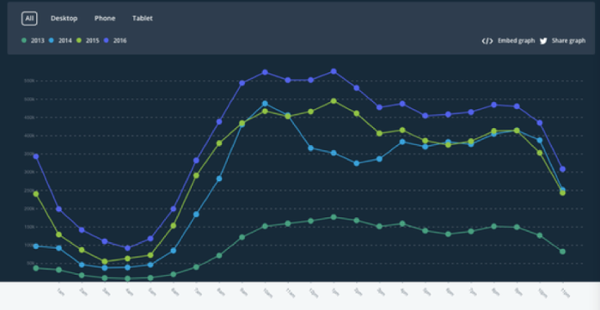 With such a massive spike in traffic on this day, and a huge potential to convert users with the right offering, it's more important than ever to make the most of these visits and ensure you're showing the most relevant content possible to the customer. Try and consider what type of products your customer is interested in at this time. 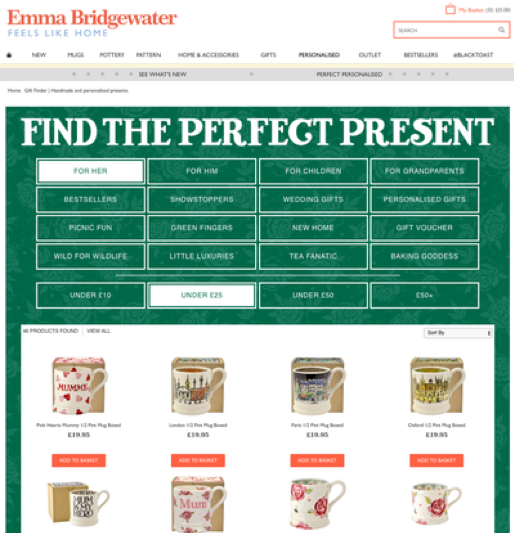 For example, a gifting site – are your customers taking advantage of some bargains to complete their Christmas shopping? Or maybe they are looking to grab a treat for themselves? Knowing this should influence the type of offer you present to the customer. Product recommendations can often be overlooked as being less important during a hectic time like Black Friday, but they can be a useful way to push promotions to your customer. 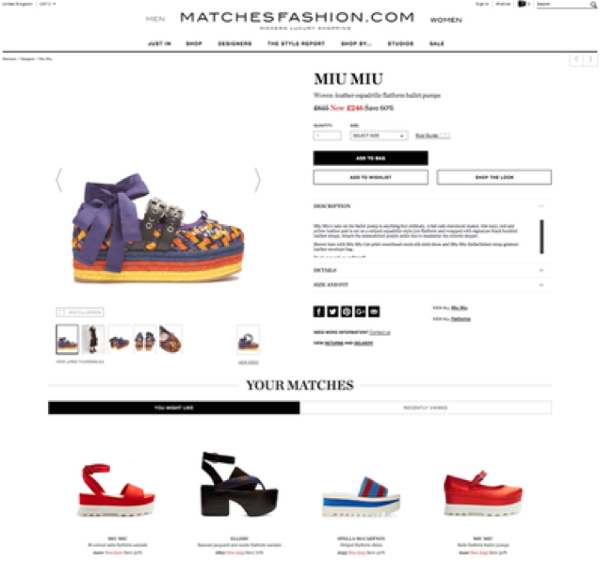 Matchesfashion.com has some very simple but useful recommendations. All products in the recommendation zone are a similar style, some are the same brand, and most importantly all items are on sale. Always remember the customer is shopping for a deal or bargain during Black Friday. 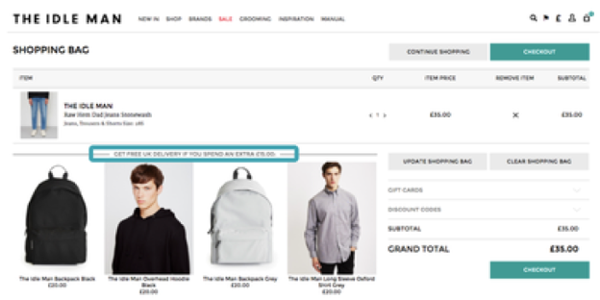 There is no point recommending full price items to users as this is not why they have visited your site at this time. Product recommendations can also help if you have multi-buy discounts over the promotional period. For example, If the user is viewing an item which is part of a 3 for 2 promotion show them other items with in the same promotion to help them to participate in the offer. If you offer free delivery over a particular basket total value then why not recommend items within the price range needed to allow the user to take advantage of the offer? This is a great way to encourage additional purchases from your promotions. With Christmas only a month away, customers are happy to buy additional items as stocking fillers. Persuasion tactic such as urgency and scarcity are also great ways to encourage customers to turn from browsers to buyers. Shoppers are aware there is a risk the items they are viewing could sell out at any moment due to the high number of other customers also on the site at this time. 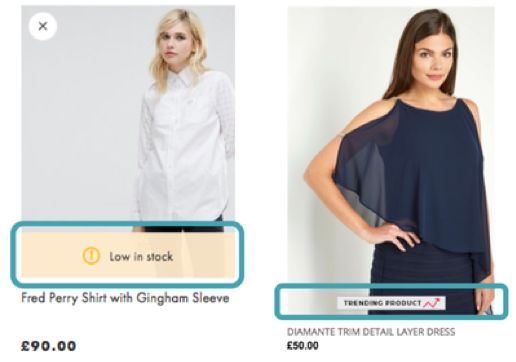 Highlighting which items are selling fast or low in stock can really give the psychological boost needed to purchase the item rather than risk missing out. Don't forget to also consider how you are managing the order of products across category pages and search at this time. For example, don't just push high stock products to the top of the page, look to push high stock quality – meaning products which are available in all key sizes. Products which have high stock might be heavily fragmented and unavailable in several sizes, leading to disappointment for some customers. It's also useful to consider how these promotions will affect your bottom line, do you need to push products which give you a higher margin for example? Many Black Friday customers may be visiting your site for the first time. They may not know your delivery or returns policy, which can lead to hesitation about their purchase. Make delivery messaging easy to locate to relieve any concerns about making the purchase. There are a number of ways which you can do this. 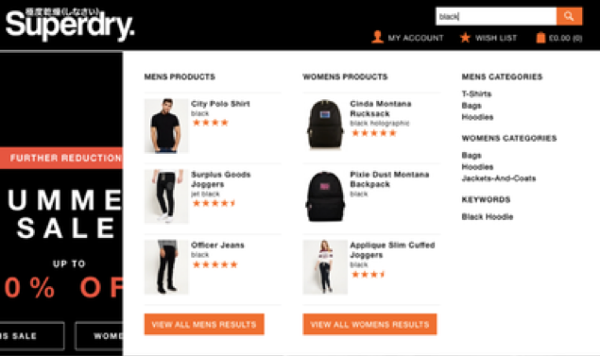 Some sites use simple search redirects, so if a user searches for delivery or returns they are taken directly to the information page, many retailers also use content spots across the site to advertise key information. Anything you can do to make finding products easier for your customer, the better! Two great ways to do this are with search autocomplete and gift finder tools. Search autocomplete creates suggestions based on keywords as they are entered into the search bar. Products are suggested based on popularity and often contain product images. This can be really useful to customers, especially when they have seen an item featured in the press or on social media, as they recognise the product quickly on sight. Likewise, gift finders help the customer to filter down their pool of products to the most relevant items according to who they are buying for, their budget, etc. Gigantic categories full of Black Friday offers can be a little overwhelming for some shoppers, a gift finder, or any similar search filtering tool, helps customer to cut their choice down to a more manageable, relevant selection. Months and months of preparation goes into every retailers Black Friday promotional planning, with often several alternative plans ready to go at any time in case one particular offer isn't working or is too closely matched by a competitor. We know customers are participating in Black Friday earlier and earlier, so be prepared to have offers ready from the start of the week to give you a head start. The most successful Black Friday promotions happen when retailers give their customers a relevant and compelling offer, but what if you're not sure which offer works best for your customer? Take advantage of the massive increase in traffic and run some A/B tests to see which promotions your customer is most engaged with. Because of the large amount of traffic reaching sites at this time, tests should reach significance fairly quickly, giving you valuable findings to reference when planning future promotions. Look at every aspect of your merchandising strategy and ensure it has been tailored for your Black Friday proposition, this will mean your product offering is perfectly matched with your marketing message, helping you to convert as many visitors as possible during peak trading.